After many months of testing and in response to many of our 458 owning clients, we are pleased to introduce our new Ferrari 458 Performance Package which has been designed to further enhance each aspect of an already amazing car. During our testing it became clear that our accurate German rolling road slightly disagrees with these Italian supercar's claimed outputs. In fact none of our customer Ferraris have quite reached their advertised road-test data figures. If we ignore the obvious answer, this could be a case of a ‘static’ dyno test vs a ‘dynamic’ road-test, or some unique in-built national bias from Maha! Either way we want to give our clients additional performance. 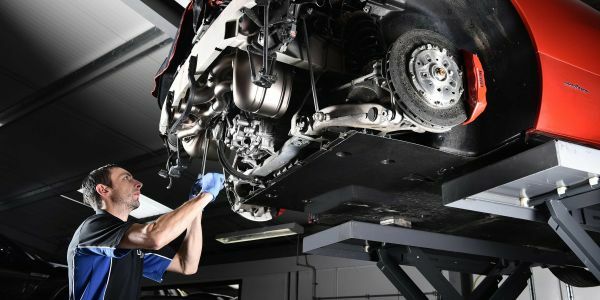 To achieve this performance, we have developed a carefully balanced remap, intake and exhaust package that delivers up to an additional 44 bhp and 17 lbft of torque over the standard offering, as well as consistent gains across the Ferrari’s significant power band. Having developed conversions for the 458 Speciale, we used the trusted basis of the Akrapovič exhaust system. 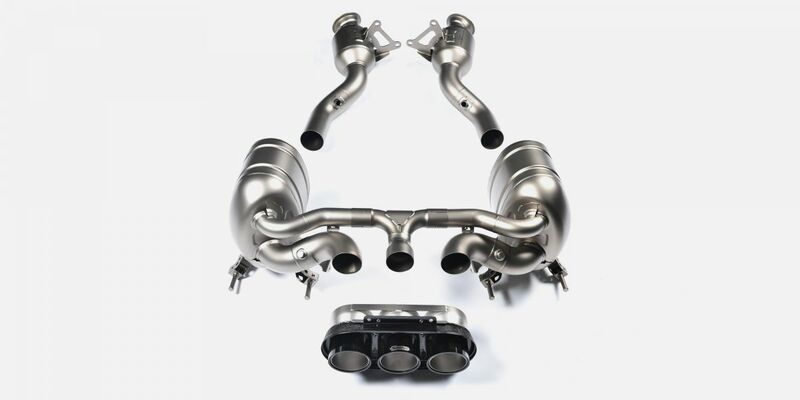 Not only does this finely crafted system result in a useful 14.2kg weight loss, when compared to the factory exhaust, but it also adds a purposeful howl to proceedings thanks to its precision titanium construction. Adding to the drama the High Flow Sports catalytic convertors emit the occasional blue flame on over run whilst still keeping the car emission compliant. 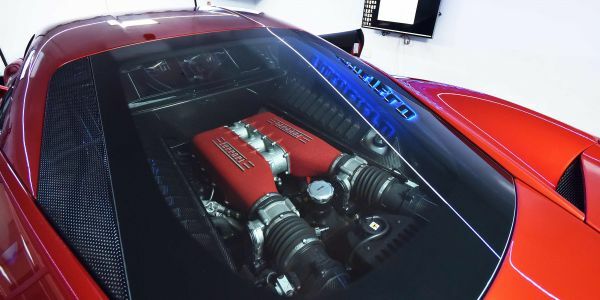 When paired with our carefully configured map, its superior flow characteristics and CNC mandrel bent curves help to take the 458 from its original 519 bhp on the dyno right up to a genuine 551 bhp. It’s a transformation that is truly noticeable from the driver’s seat, whether that be ‘static’ or ‘dynamic’. 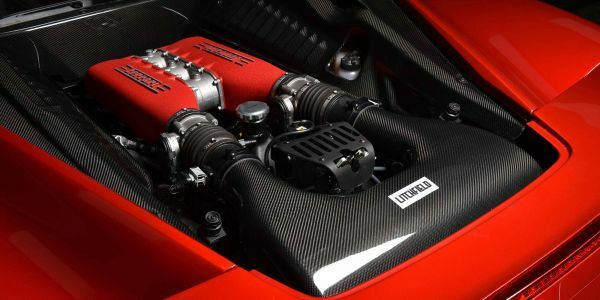 The 458 already has a stunning engine bay. We then add our Carbon fibre airbox, housing performance air filters, enhancing the incredible view through the rear screen. These filters are produced in the UK and allow the engine to breathe more easily, especially at higher rpm. The finishing touch comes in the form of a precision alignment. 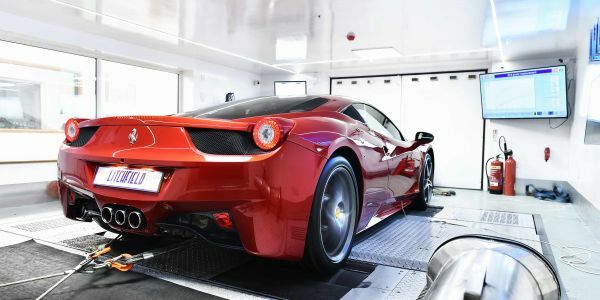 The 458’s chassis is aligned to our own special ‘fast road’ settings to ensure that each tyre has the perfect contact patch with the road, as well as creating the optimum steering and chassis geometry to give the car precise, yet benign handling. The result of the Litchfield 458 Performance Package is a car that maintains its perfect factory good looks, but packs a much more rewarding and involving punch for its driver.